For those of you with a 5 second attention span, here’s the abbreviated version of this review: Rincon 38 is amazing. You should go there. If I could just write that sentence a few hundred times and still not feel like I’ve said enough good things about the food here. 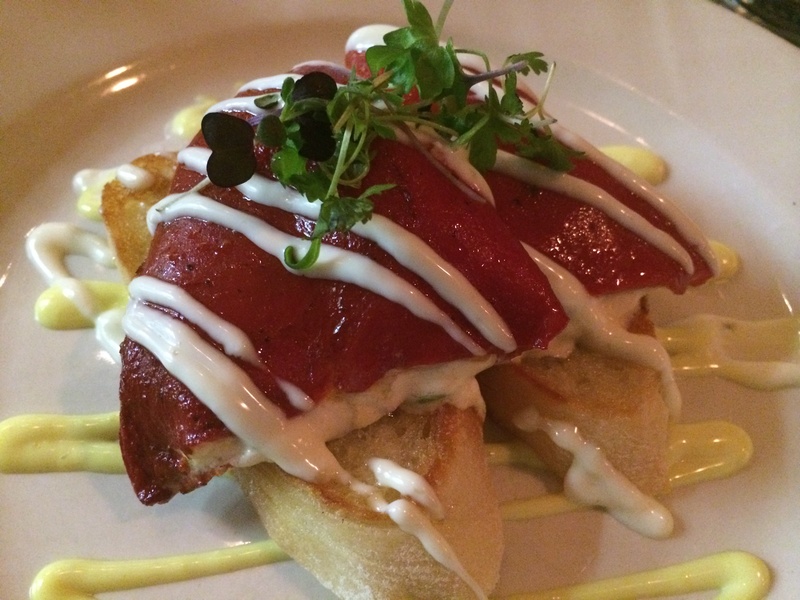 Rincon 38 is the new tapas venture from Hector Ruiz. You may recognize that name from Rincon’s sister restaurant, Cafe Ena. While Cafe Ena is suave and polished, Rincon 38 is more like a cool younger sister. The space is small, but what it lacks in size it makes for in intimacy and character. This is the type of place you can find yourself spending several hours over wine and small plates.And the food is incredible. We started out our evening with the Queso Frito. Yep, fried cheese. But this is not yo’ mama’s mozzarella sticks. 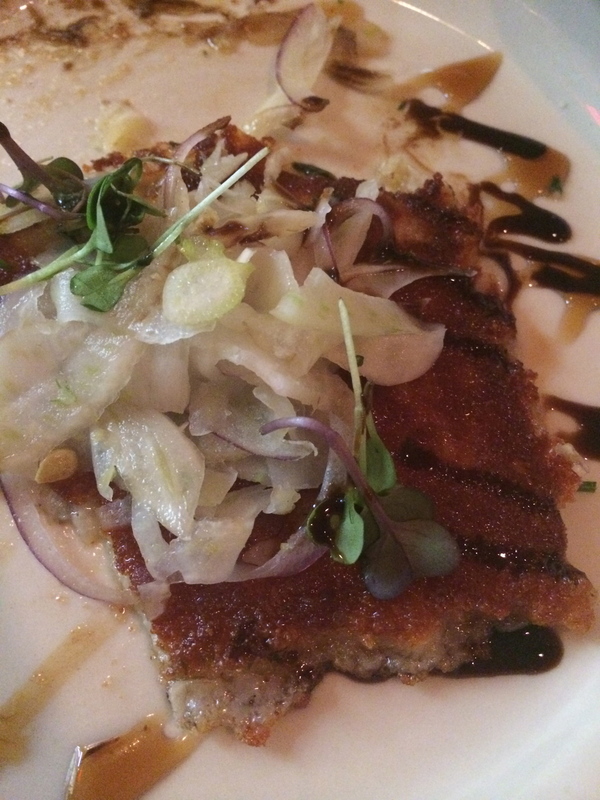 This is a fried Manchego served with a red onion-fennel slaw, drizzled with sherry glaze, topped with micro greens that perfectly balances sweet, savory, and just a bit of crunch. It also pairs nicely with any of the wines off their small, but delectable wine list. Rincon is a quality over quantity sort of place. Next up, we sampled the Cannoli, an Italian pasta filled with fresh lobster, crab, parsley, ricotta-mascarpone cheese and served over a truffle-almond sauce. I was surprised that of everything we tried this was my least favorite. Probably because it sounds so luxe it couldn’t possible be anything other than delightful, but we found it a bit heavy for tapas, and there was something about the flavors that made it a touch too rich. Which brings us to the Carne Brava. Oh my goodness, this carne brava. Something about me: I don’t like my beef anything less than medium. However, this carne brava has made me a believer. 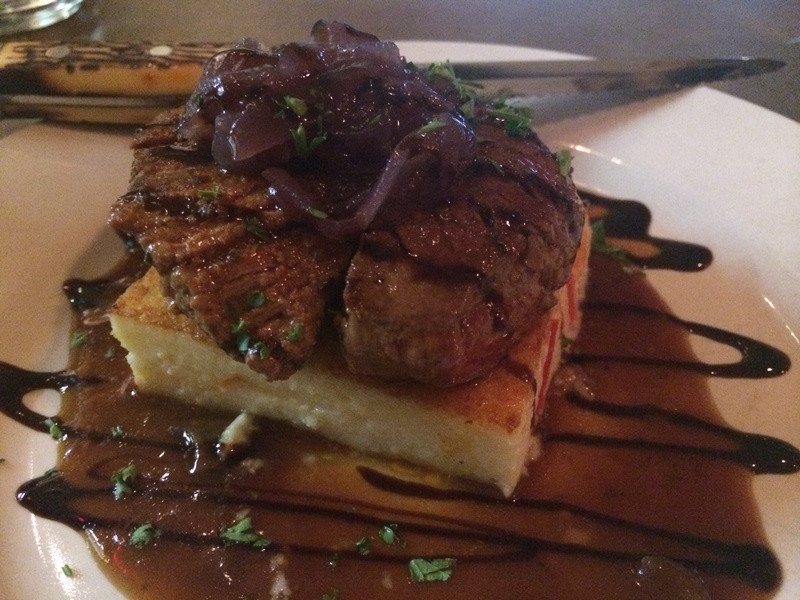 This seared petite beef medallion crusted with Pimenton is served over a polenta cake with veggies, Rioja onions & red wine sauce that is neither too acidic nor too fruity. You’d think if I found the lobster cannoli to be too heavy, the same would be true of a of a beef medallion, but the meat is so perfectly cooked, and the polenta cake lends such a delicate sweetness, that this dish will always be on steady rotation whenever I hit up Rincon 38. It’s pure heaven. There really are no words to describe it. Even my boyfriend, who thought we couldn’t top the Carne Bravas was blown away by something that sounds so simple, but manages such a complex layering of flavors and texture. If my rave review isn’t enough to get you in the door, consider this: I rarely repeat restaurants within a 6 month time frame. There are just too many places to try. But I’ve already been there twice in the past two months, and I am planning to hit it up again on a Wednesday or Thursday night when they host live Flamenco music. And if this weather keeps up as it has been, I’m going to need a fictitious trip to Spain pretty soon. This entry was posted in Uncategorized and tagged Best dishes, cannoli, Carne Brava, fried manchego, Minneapolis, Piquillos, restaurant review, RIncon 38, South Minneapolis, tapas restaurants by theculinarycapers. Bookmark the permalink. Was just there last week — the food and service were top-notch. Can’t wait to go back again and try some other dishes. I’m excited to go back as well. I’m so glad we have a great tapas place in Minneapolis!